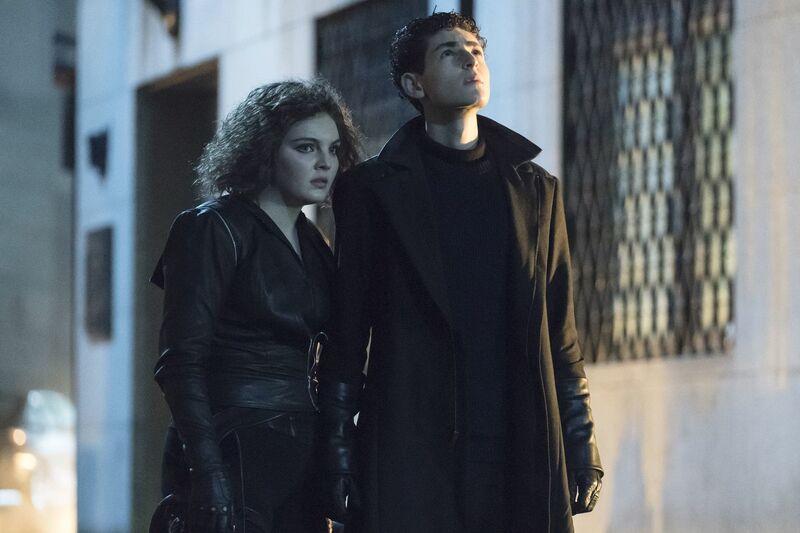 Camren Bicondova as the young Selina Kyle and David Mazouz as Bruce Wayne in a scene from the Thursday, April 18, episode of Fox's "Gotham," which sets up the "Batman" prequel's April 25 finale. When he signed on to play the young Bruce Wayne in Fox’s Batman-prequel Gotham, David Mazouz wasn’t focused on the day he might be expected to step into the Batsuit, something he’s expected to do — in a fashion — in the DC Comics-inspired drama’s April 25 finale. Trump shared a video featuring Batman music. Twitter took it down. Earlier in the day, at press conference for the show, Gotham showrunner John Stephens had addressed the question of whether it would be Mazouz whom viewers would see as Batman as the finale fast-forwards 10 years. Mazouz, who turned 18 on Feb. 19 (and who said he learned the growl from costar Ben McKenzie), was only 12 when he auditioned to play the future Batman. But he already knew that TV’s a chancy business, having spent two seasons playing the mute, mysteriously gifted son of Kiefer Sutherland’s character in the drama Touch before that show was canceled. Ben McKenzie (left) as Jim Gordon and David Mazouz as the young Bruce Wayne in a scene from the pilot for Fox's "Gotham," which aired in September 2014. "When you sign a seven-year contract, you’re not thinking where you’re going to be seven years from now. Because it almost never is relevant,” said Mazouz, who’s from Los Angeles and who ended up spending most of his adolescence filming the series in New York. Although “there was a while there when I had a really hard time adjusting to the move and I felt like I was living half a life," he said. “Every hiatus, I would come back and spend three months at home. And whenever I spent a significant amount of time at home, I would say to myself, ‘I would be so bored if I was only doing high school.’ "
Gotham was developed for television by Bruno Heller (Rome, The Mentalist), whose next project, for Epix, is Pennyworth. An even earlier Batman prequel, it stars Jack Bannon as the young Alfred Pennyworth, a former Special Forces officer who works for Thomas Wayne (Ben Aldridge), who’ll eventually become Bruce’s father, in 1960s London. In part because of the constraints reportedly placed on it by DC Comics, which wants to reserve certain characters for big-screen projects, Gotham has kept its viewers guessing about some of its rising villains. “You would think that you know the story and you would think that Gotham’s not an interesting show to watch because you’re like, ‘Oh, I know that that guy’s not going to die. So this scene isn’t suspenseful,’ ” Mazouz said. “But we trick you. We do kill those characters sometimes. And we do bring [in] other characters to do things that [different] characters in the comics have done." The writers “perfectly mix kind of the best of canon with [their] own interpretations on things,” he said. Gotham. 8 p.m. Thursday, Fox.